you are kinda sorta speaking my language. beans in general are were not my fave. until i spent a long weekend in puerto rico and tried red beans & rice for the first time. it was a revelation. i have since tried plenty of other beans and recently, i tried cooking black beans to good results. i think the key to beans for me (and to not be bloated etc) is ample soaking. i do not buy the canned stuff, and i soak dry beans for 24 hours and then boil them for another hour to ensure softness and the breakdown of whatever scientific proteins for easy digestion. I tried my hand once or twice at soaking black beans and making them from scratch.� It did not go so well.� So this is one of my more tenuous food relationships. Baked beans are my nemesis, but I LOVE black beans. So I’m glad to hear you’re coming around to them–at least a little. =) The wontons sound scrumptious. 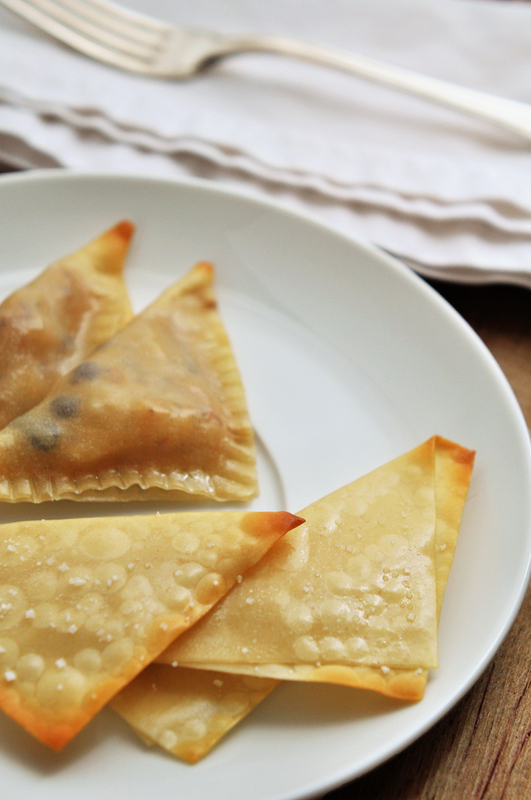 Every time I’ve tried to use wontons creatively like that, I end up in a bad place.� Do you know how jagged and brittle those things can get? Thanks so much for the link. I like the idea of adding shrimp to this recipe, and I never would have thought to use cream cheese. Sounds like a delicious addition though. Jen, I think I just happened to have some left over shrimp that I needed to use when I made the wontons. And I had seen a shrimp paste recipe that gave me the idea to marry the beans, shrimp, and cream cheese. It was delicious.